Why did archaeological excavations take place here? EDF Energy is landscaping the southern boundary of the Hinkley Point C site. 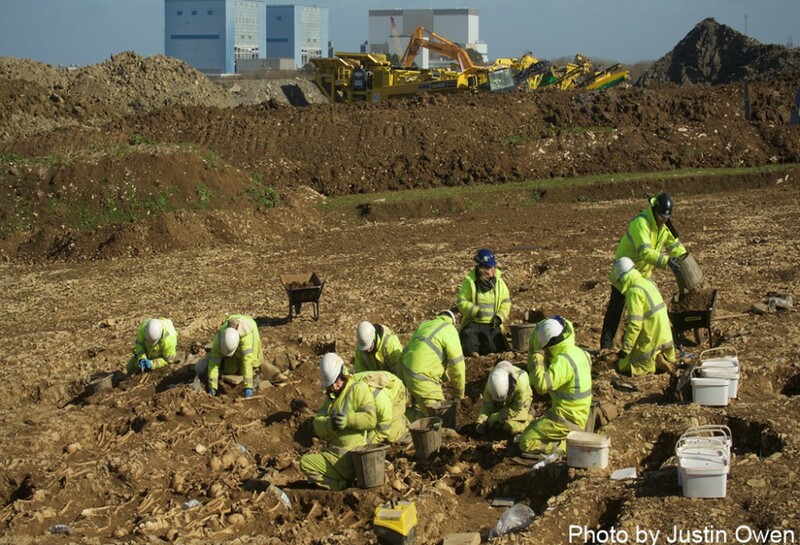 When the landscaping is complete it will be planted and become a permanent feature between Shurton and Hinkley Point C. Before the work of landscaping begins, the archaeology had to be uncovered and investigated. Cotswold Archaeology carried out the archaeological excavations here. Archaeological site monitoring is done by the South West Heritage Trust, on behalf of Somerset County Council. How did the archaeologists know where to dig? Geophysical surveying in 2009 identified a possible Bronze Age enclosure and other archaeological features. This led to trial trenches being dug here in 2010. What is known about the archaeology? Archaeological features included Iron Age ditches and Post-Medieval ditches. One very exciting discovery was an early Bronze Age cremation urn. Other finds included pottery dating from the Roman period and pottery from the 12th to 14th centuries. Full scale excavations took place in 2016 to discover more evidence of past activity. The Bronze Age enclosure has been fully excavated. The ditch is about 3 metres deep and 2-3 metres wide. The diameter of the enclosure is about 50 metres. An entrance way facing south has post-holes and we think that a wooden gate once stood here. This is a considerable monument and one which required a lot of effort to build. A large quantity of mid to late Bronze Age pottery has been found in the fill of the enclosure ditch, along with butchered animal bone. This suggest that the enclosure may have been used for feasting! From the pits outside the enclosure, archaeologists have found slag from possible metal working and a Roman spindle whorl, used for producing woollen thread from fleece. Excavation in the northern part of the field has shown a Post-Medieval field system following the pattern of a Roman field system. Finds include Post-Medieval pottery and clay tobacco pipes. Excavation has begun in the southern part of the field. There is evidence of a small settlement here. A few human burials have been found and are thought to be Roman in date. Roman pottery sherds include Black Burnished ware and Samian ware. A midden of limpet shells show that people were fishing. The brook may have been wider and and navigable by small boats. What is known about more recent history? A post-medieval building called ‘Corners Farm’, once stood in the south-east corner of the development area. The earliest reference to it is on the 1841 tithe map which shows a ‘house, barton, garden and two orchards’. Few signs of the deserted farm survived above ground. The floor of ‘Corners’ has now been uncovered along with finds of pottery, glass bottles and a boot-scraper! Even more exciting is the discovery of pottery sherds, post holes and a foundation wall underneath ‘Corners’ indicating that a medieval building was here before! A short stretch of stone wall has been built along a section of the north bank of Bum Brook. This was constructed to prevent further erosion of the bank and may be 20th century in date. We think that thousands of years ago it may have been a wider flowing river. Perhaps Bronze Age people visited the enclosure by boat?